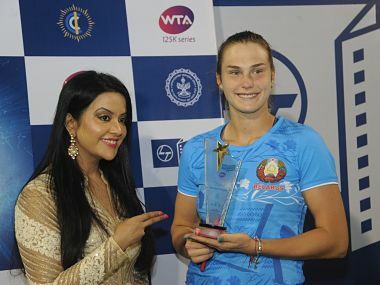 Mumbai: Top seed Aryna Sabalenka of Belarus drubbed unseeded opponent Dalila Jakupovic of Slovenia in straight sets in a one-sided final to win her first WTA singles crown at the $125,000 L&T Mumbai Open tennis tournament on Sunday. The 19-year-old from Minsk ranked 96, stood tall and used her power-packed forehand and big serves to completely overwhelm her hapless opponent 6-2, 6-3 in just 64 minutes to walk away with the winner's purse of $20,000 and 160 WTA points. The 24-year-old Jakupovic, ranked 265 and with 5 ITF titles under her belt including the one clinched in Aurangabad, had to be satisfied with the runners-up prize money of $11,000 and 95 WTA points to her credit. Sabalenka, who boasts of a Fed Cup win over current US Open champion Sloane Stephens this year in the inter-nations final, broke her Slovenian rival twice, in the 2nd and 8th games, to run away with the opening set in just 31 minutes even before the stands got filled at the Cricket Club of India courts. Screaming her way after every serve or hard-hit point, Sabalenka had a brief hiccup in the second set as she dropped her serve in the opening game before she bounced back to break back in the 4th game to restore parity. She then broke Jakupovics serve decisively in the 8th game to take a 5-3 lead and then served for the match and title just inside the hour. Jakupovic raised visions of a fight-back briefly when she secured a break-point with an excellent lob but it was a false dawn as Sabalenka, who has already won four ITF singles crowns including a $25,000 title in Pune two years ago and had lost to Russian Grand Slam champion Maria Sharapova in the Tianjin Open final last month, saved the break-point with a second service winner. The 1.82m tall Belarussian, who had risen to a career-high ranking of 76 last month, then went to match-point with another strong serve and won the game, set and the singles title when Jakupovic hit her forehand long. The 26-year-old Jakupovic, from Jesenice in Slovenia, also served double-faults at crucial times and had a weak second serve that was taken full advantage of by her younger opponent who mercilessly killed it. While Sabalenka served three aces as compared to her rival who came up with two, she served only one double-fault while Jakupovic served four. Sabalenka won 1 out of 2 break-points while her rival was successful with just one out of five. In the opening set, Sabalenka quickly jumped to a 3-0 lead before her rival could even settle down. When she led 4-2 Jakupovic had a chance to break back but the Belarussian saved three break points and then went 5-2 up with a big serve followed by a volley winner. Jakupovic, on the other hand, started the next must-win game in the set with a double-fault and was down set-point following a splendid forehand on-the-run winner by Sabalenka who then broke the Slovenians serve when Jakupovic buried her forehand into the net. Sabalenka dropped her serve, much to everyones surprise, in the very next game at the start of the second set but broke back in the fourth. She then broke Jakupovics serve again in the 8th game with a forehand shot deep into her rivals backhand corner that was put out. This was the final game in which the teenager was trailing a bit and saved a break-point at 30-40 with the help of her strong serve and then clinched the match and title on her first match-point. "It was not a good match. She played very good tennis on a high level. She tried to beat me, but I was aggressive and it allowed me to take the pressure off me," said Sabalenka. "The win will help me get a get a direct entry into the Australian Open main draw. It will be easier for me to play there. I will now take a week's break, spend time with friends and family and resume my pre-season training after that," she said. About her screaming after every point, she said it helps in her game. "I have been doing it for the last 13 years since I started playing at the age of six." "Playing here in India felt like being at home with the weather more or less like at home. People are very friendly and nice. More importantly I enjoy eating the cheese-garlic naan," Sabalenka said. "When I was coming to India from Taipei I was thinking I would get another opportunity to have garlic-naan. I am eating it after 2 years. Its spicy but not too much, like some other food back home," she said.